If you know the iPhone 4, you may think you also know the iPhone 4S. After all, they do look a lot alike. But even though they have basically the same body and similar ports, they're not identical. Whether the iPhone 4S is your first iPhone or if you're upgrading from an earlier model, here's an explanation of what every button, port, and switch is and does, which should help you get oriented to using your new phone. The iPhone 4S has been discontinued. You can find a list of all the iPhones here, including the most current models. Ringer/Mute Switch: This small toggle switch on the left-hand side of the iPhone 4S lets you quickly mute the iPhone 4S's ringer by flipping the switch down (muting the ringer can also be done in the Settings app, under Sounds, too). Antennas: These four thin black lines, one at each corner of the phone, are the iPhone 4S's two antennas. The placement of the antennas is redesigned compared to the iPhone 4, which had antennas at the bottom corners and along the top. These antennas are part of a dual-antenna setup that allows both to operate independently to increase call quality. Front Camera: This camera, placed next to the speaker, takes VGA-quality photos and shoots video at 30 frames per second. You also use it to take selfies and have FaceTime video chats. Speaker: The speaker is where you hold the phone to your ear to listen to phone calls. Headphone Jack: Plug your headphones, and some accessories, into the headphone jack at the top left corner of the iPhone 4S. On/Off/Sleep/Wake Button: This button at the top right corner locks the iPhone and turns the screen off. You can also use it to restart the iPhone, turn it off, and put it into recovery and DFU modes, and take screenshots. Volume Buttons: These buttons on the left side of the iPhone let you turn the phone's volume up and down (this can be done in software, too). When you're taking a picture with the pre-loaded Camera app, the volume up button snaps photos as well. Home Button: This button on the front center of the phone's face does many things: it completes app re-arrangement and is involved in restarting the phone and using multitasking. Dock Connector: This 30-pin port on the bottom of the iPhone is used for syncing the phone with a computer and connecting the phone to some accessories. This port is not the same as the 9-pin Lightning connector introduced on the iPhone 5. Speaker & Microphone: There are two grills on the bottom of the iPhone, one on either side of the Dock Connector. The one to the left of the connector is the microphone that picks up your voice for calls or when using Siri. The one to the right is a speaker that plays audio from apps, the ringer when calls are coming in, and the speakerphone feature of the Phone app. SIM Card: The iPhone 4S's SIM card is in a slot on the phone's right side. The SIM Card is used to connect your phone to cellular phone and data networks. Back Camera: The camera on the top left corner of the phone's back is the primary one. It's an 8-megapixel camera, which can also shoot 1080p HD video. Camera Flash: Positioned right next to the Back Camera, the Flash improves low-light photos and produces more true-to-life colors. Apple A5 Processor: The iPhone 4S is built around Apple's snappy A5 processor. It's a slight upgrade over the A4 at the heart of the iPhone 4. 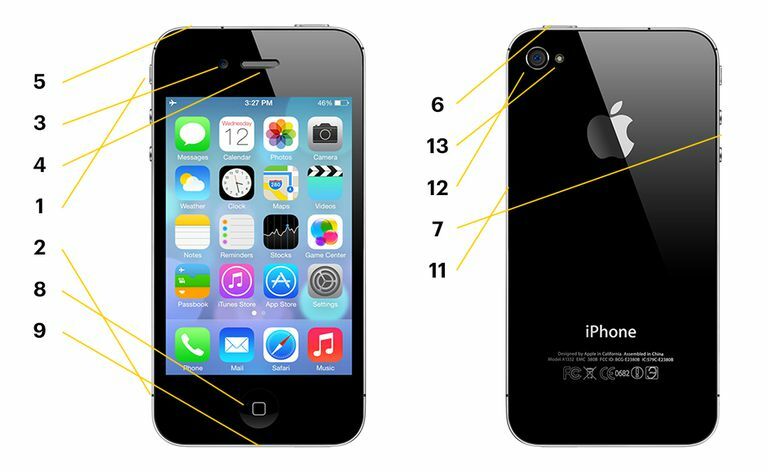 Sensors: The iPhone 4S's sensors, including the accelerometer, are used to understand how the phone is being held and moved, and where it is on a map, for various features and apps.